Rate $2675 per night plus tax, $1250 clean (includes every other day clean) $10k refundable damage dep. 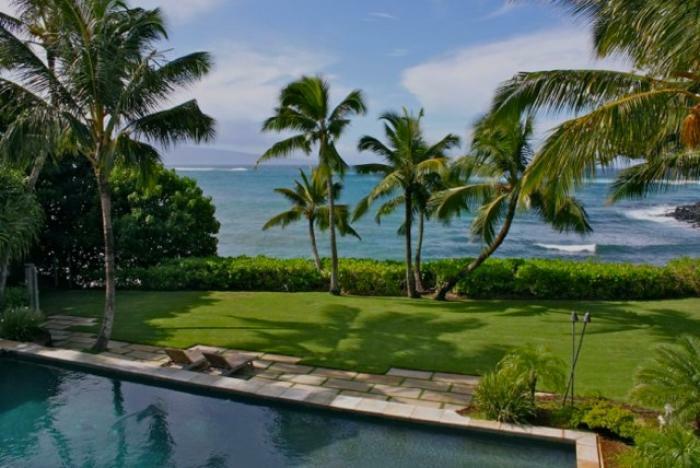 Banyan Cove is a deluxe, gated, 1.3 acre, oceanfront property on Maui"s famed north shore. Most rooms feature gorgeous ocean views and all bedrooms have en suite baths and walk-in closets. Enjoy a day on the water or in bohemian Paia Town. Savor an early dinner on the lanai as the sun sets. Retire to the home theater. Main Home Size: 7,384 sq. ft. Guest Home Size: 936 sq. ft.
Additional Features: Pool, Jacuzzi, Media Room, BBQ, Oceanfront, Privacy and Quiet. This home features industry leading Lutron Lighting with integrated Crestron controls and audio system. This custom system is configured to control the entire house including lighting, HVAC, pool & spa, water features, outdoor lighting, fans, blinds, security, audio and gate camera. Internet access to the Automation system and backyard webcam included. Our custom home system features a Runco DLP 1080P THX Theatre projector with automatic drop down screen. We also feature a 5.1 Digital Dolby Surround Sound audio system to support the incredible picture you will get from this system. You can drop the blinds with a push of a button using our Lutron lighting controls. We also feature a Sub Zero refrigerator / freezer drawers in our theatre room, along with a Miele dishwasher and sink with hot and cold water dispenser. This home features a computer controlled HVAC system and features multiple zones. The main house has 6 various zones. The Ohana or cottage property features one zone. Our custom home system security system features state-of-the art technologies. Banyan Cove is a deluxe, gated, 1.3 acre, oceanfront property on Maui’s famed north shore. Most rooms feature gorgeous ocean views and all bedrooms have en suite baths and walk-in closets.